I’m pleased to report that after an estimated 12 years off the road, the Saab lives again. Last week, we had frankensteined parts of the old fuel pump assembly onto the new one to make it fit. But even though the pump now ran, the engine did not. And we weren’t quite sure where to go from there. Checking fuel pressure would surely narrow it down. 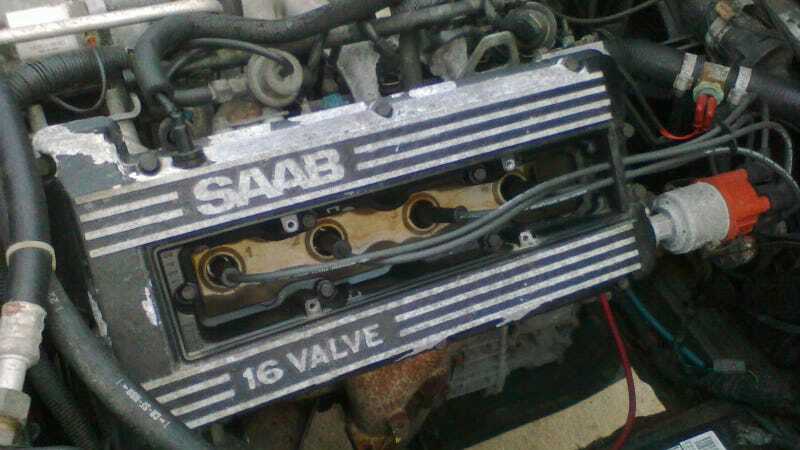 Alas, Saab did not include a Schrader valve test port on these cars. The manual suggested we use a test gauge with a banjo fitting on it and plumb it in-line. Yeah, well screw that; I want a damn puffalump valve, so that I can use the gauge I’ve got. The thin-wall tube of the fuel rail did not look like it would provide much thread engagement, so we removed one of the banjo bolts, and drilled through the head. I then threaded the hole with a 1/8" NPT tap, and installed the valve stem with thread sealant. I hadn’t used the gauge in a long time, so I tested it on my car first. We then put it on the Saab and turned the pump on- nothing. No pressure at all. What gives? We pulled the pump back out, only to find the pickup basket empty. The tank had about four gallons of fuel in it, which should be more than enough to prime the pump and keep it fed for a while. So we filled the basket back up, re-installed it, primed the pump, verified proper fuel pressure, and fired it up. The engine ran (poorly)... for about half a minute before stalling and refusing to start again. Fuel pressure was reading good at first, but fell back down to zero. So we pulled the pump again and found the basket empty. It was draining the basket, which was somehow not being replenished by the tank. Now the old pump did not have a strainer on it. Could the sock on this one be providing too much resistance for fuel flow? Unlikely, but we were just about at our wit’s end here. So out came the pump, off came the strainer, and we set it all back up to run again. SAME. THING. It was time to inspect that little valve-looking thing on the side of the basket. It’s supposedly called an “ejector pump”, but I’m not familiar with these, and I don’t understand how it “pumps” or “ejects” anything. We were afraid to attempt disassembly, for fear of breaking it, and we were also afraid to do that to the original Saab unit, which we might end up having to retrofit onto this one. We slid the “ejector” straw out of the basket, and found what appeared to be a a brass orifice. The OEM pump had no such thing, and we never found anything like that fallen off in the old tank or basket. So I decided to remove the orifice. We were just about too shoot some compressed air through the straw, but I looked inside and found what appeared to be a small ball bearing, sealing the straw! I grabbed an allen key to force it out, but it would not budge. It was wedged ridiculously tightly in the middle of the straw, where there could not possibly be some kind of valve mechanism. Perhaps it came from the main body of the “ejector pump”. If so, then it was highly likely that it would jam right back into the straw. We checked out the old unit, which had some kind of dirty blockage inside that was hard to make out. We were still to afraid to open and potentially break it, so we took a chance and cut the end of the new straw off, releasing the bearing. The straw was now open, and blowing through it confirmed that fuel could get through. We put the strainer back on, confident that we had found the true blockage, and that the sock was not part of the problem at all. So we put the pump back in one more time, filling the basket with fuel, and fired it up. Pressure was good! The engine ran, but still poorly. After about a minute, I used an infrared thermometer to check each exhaust port. Cylinder #1 was the only one not firing. We pulled the spark plug, but it was dry. Then all of a sudden we noticed that the injector harness was not fully seated on the #1 injector. Bingo! I plugged it back in, we fired the engine back up, and it ran. It ran good. It ran smoothly. So we let it run! We wanted to see it get up to operating temperature. After about 20 minutes, we detected the thermostat to have opened. Soon afterward, one of the electric cooling fans came on! Looking good! The alternator was not charging the battery though, so we’ll investigate that next. But it runs! It runs so good.